The next few months ahead our sector will be buzzing. We find some not-to-be-missed events in different Spanish cities before summer comes. Write down in your agenda the Salón Internacional del Club de Gourmets and ExpoFood Service in Madrid, and Alimentaria in Barcelona. In less than two months the 30th edition of the Salón Internacional del Club de Gourmets, in brief called Salón de Gourmets, lands on IFEMA, Feria de Madrid. From April 4th to the 7th, this International Fine Food and Beverage Fair offers product launches, workshops, competitions, award ceremonies, round tables, and of course tastings. Without a doubt the meeting point for delicatessen products and a reference for quality European food. 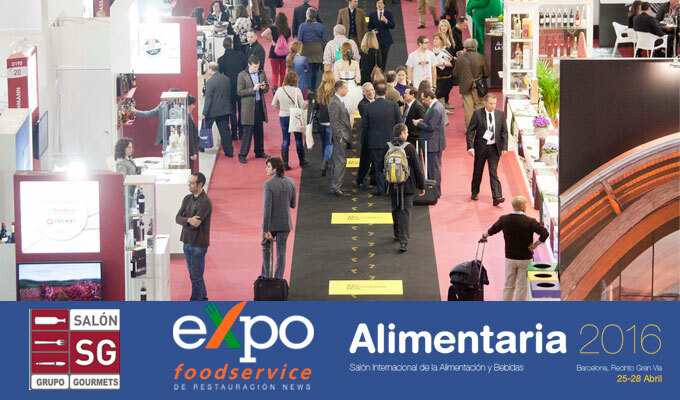 In 2016 it will be the 40th edition of Alimentaria Barcelona, the most relevant biannual fair if the Food sector. Between April 25th and 28th at Fira Barcelona will display all the qualities that have made possible its growth: internationalisation, innovation, gastronomy and sector specialization, along with an attractive update of some of their halls and contents. In this edition, the fair will double its efforts to attract suppliers worldwide, especially from Asia, The United States and Latin America, aside from Europe. The exhibit ill bring together firms from over 50 countries, which makes Alimentaria an major international event. It will also be a reference in terms of innovation, with different experts analysing present and future trends, as well as the most innovative products. In short, a grand showcase for what is cutting edge today and what lies ahead. Leaping onto May, ExpoFood Service will take place on the 27th and 28th in IFEMA (Madrid), bringing together over 3,000 catering professionals. This year the fair will increase the areas dedicated to exhibitions, meetings and parallel activities, with the clear objective of promoting business dealings. This commercial rendezvous is therefore the perfect place to introduce restaurants, hotels, social catering companies, distributors and independent restaurants to leading edge suppliers of food and beverage, services and equipment with a catalogue prepared and specialized in the Horeca sector.